Departs Wellington Thurs 22nd January 2015. Silversea Expeditions offer journeys that are just as exhilarating as they are luxurious. Immerse yourself in the rich history of the Māori culture; the first settlers of New Zealand. Visit Nelson, New Zealand’s sunshine capital, and home to the Neudorf Winery situated in the Upper Moutere Valley of Nelson. Neudorf Winery was established by Tim and Judy Finn in 1978 and is credited with producing one of New Zealand’s best Chardonnays. 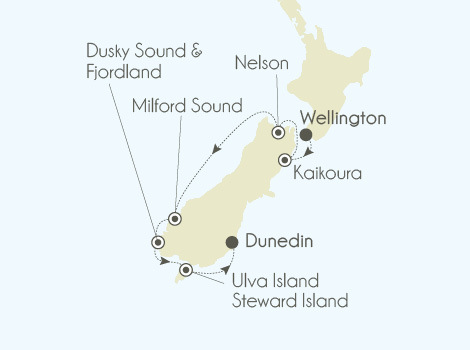 Let the striking beauty of the peaks and waterfalls of Milford Sound and Dusky Sound take your breath away. Celebrate a myriad of rare animals, such as the smallest dolphin in the world, the Fiordland Penguins, and endangered sea lions. Mulberry Travel offered us a different experience that we really enjoyed.